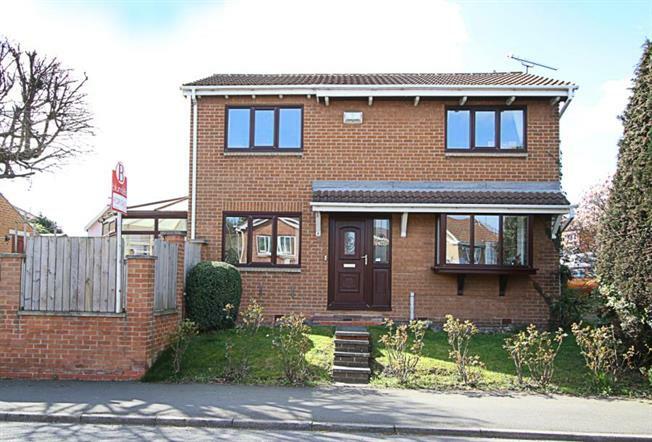 3 Bedroom Detached House For Sale in Sheffield for Guide Price £195,000. Blundells are pleased to have offered for sale is this superb three bedroom detached property positioned on a fantastic corner plot with gardens to the front side and rear, driveway with detached garage providing off road parking. Benefitting from well-proportioned living accommodation. The property boasts uPVC double glazing, Gas Central heating, uPVC Conservatory to the rear and a newly fitted modern family bathroom. Situated in sought after area of Sothall we strongly recommend an early viewing so not to be disappointed. In brief the accommodation comprises: To the ground floor the Entrance hall with stairs rising to the first floor landing, a door leads into the dual aspect lounge and a further doors enters the dining kitchen which in turn leads into the conservatory. The conservatory has French style doors accessing the rear enclosed garden. A rear entrance lobby has a door leading to the ground floor WC, along with doors also accessing the lounge and kitchen. To the first floor landing is the front facing master bedroom, further double bedroom two, bedroom three and the attractive modern family bathroom in brief comprising: wash hand basin and low flush wc in a combination storage unit and bath with bifold shower screen and electric shower over bath. Tiling to the walls and ladder towel radiator. Externally: The property stands in well maintained gardens both to the front, side and rear, the driveway leads to the detached single garage.